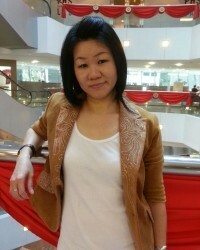 Meet hairstylist Joanne Goh. Beneath that quiet, shy demeanor is a woman determined to make you as beautiful as she possibly can. The best part about this is that this determination and intensity is tempered by her understanding of hair and her clients’ needs, their comfort. “I have worked in a hair salon for eight years,” she announces confidently. Having trained as a hairstylist, she worked her way up the ranks – from doing straightforward tasks like shampooing to coloring, cutting and of course, styling. “There are no simple tasks in the salon, especially not at THE salon,” says Joanne. She takes her work very seriously, even the small things. For every task to her is geared towards making the customer beautiful, and making them happy. “Some aspects of hairstyling may seem simple and become overlooked, but for me, it is the ‘little things’ that make up the details, and these are things that a person going to a hairstylist would appreciate and remember,” she adds. As a child, Joanne had always been fascinated with hair. Her opportunity to train as a hairstylist was a dream come true for her, which perhaps goes a bit into explaining the passion she has for the profession. Having worked her way from being a shampoo girl to a stylist, Joanne has gained much needed experience to deal with customers at every level. Very importantly too, Joanne, while displaying an impressive knowledge in matters pertaining to beauty, color and style, remains humble and extremely modest about her abilities.